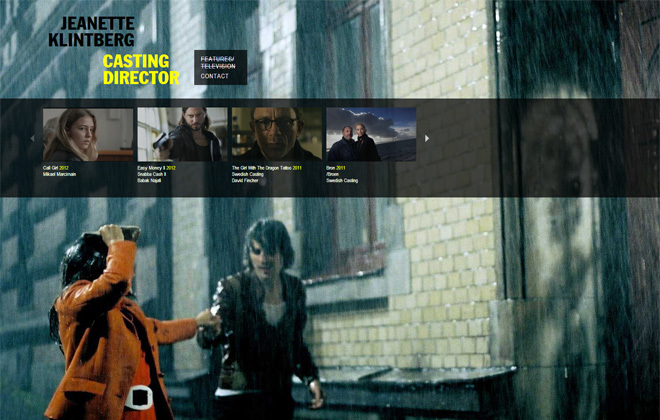 Jeanette Klintberg is one of Sweden’s leading casting directors. She has worked with films such as Beyond, How soon is now, The Laserman and Easy money. The slideshow is created in a way that each film is its own article in WordPress. By using a combination of the plug-ins Shadowbox JS and a modified WP Carousel the pictures and links to films are retreived from the articles content and presented in a Shadowbox. If the article contains different media content the most appropiate is chosen based on the visitor’s browser. For example, if a link to a .mov film clip is present it will be showed on iPhone/iPad Safari, if a link is added to a .ogg film clip and the visitor has a browser supporting HTML5 this will be used to show the movie. The solution also support Flash and other formats. See more and watch trailers from the movies she has worked with at jeanetteklintberg.com.